The combination of enzalutamide (Xtandi) and docetaxel improved 6-month progression-free survival (PFS) rates compared with docetaxel alone in patients with previously untreated metastatic castration-resistant prostate cancer (mCRPC), according to data from the phase II CHEIRON study. In the study, patients were randomized to receive either docetaxel at 75 mg/m2 for 8 cycles every 3 weeks, plus prednisone at 5 mg, or the same treatment plus enzalutamide given at the standard dose of 160 mg daily for 24 weeks. Results showed a 6-month PFS rate of 89.1% in patients treated with the addition of the androgen receptor (AR) inhibitor compared with 72.8% in patients treated with single-agent docetaxel (P = .002). At a median follow-up of 20 months, the median PFS was 10.1 months versus 9.1 months in favor of the combination arm (HR, 0.71; 95% CI, 0.54-0.94; P = .01). However, the combination was not found to improve median overall survival (OS) compared with docetaxel alone at 29.6 months versus 33.7 months, respectively (HR, 1.13; 95% CI, 0.75-1.71; P = .5). Major grade 3/4 hematologic toxicities observed with the combination consisted of anemia and neutropenia. Febrile neutropenia was observed in 10 patients who received the combination compared with 5 patients who received docetaxel by itself. Further, grade 3/4 neutropenia was seen in 23 patients treated with the combination and 19 patients treated with docetaxel alone. 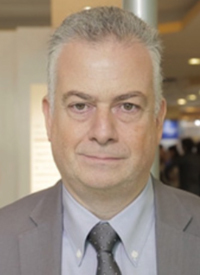 Lead study author Orazio Caffo, MD, director of medical oncology at the Santa Chiara Hospital in Trento, Italy, said that other novel agents are being explored with docetaxel, including the PD-1 inhibitor pembrolizumab (Keytruda) in the ongoing KEYNOTE-365 study (NCT02861573). In an interview with OncLive, Caffo discussed the CHEIRON trial findings and their implications on the treatment paradigm in mCRPC. OncLive: What was the rationale for combining these 2 agents in the CHEIRON study? Caffo: Today, docetaxel and enzalutamide are the consolidated frontline treatments for patients with mCRPC. According to the different mechanisms of action, there is a strong rationale for combining these 2 treatments. Docetaxel acts mainly on the microtubule machinery, thus being able to interfere with the AR and also with cellular duplication. On the other hand, enzalutamide acts mainly on AR machinery. We enrolled patients with previously untreated mCRPC and they were randomized to receive either docetaxel alone given for 8 cycles every 3 weeks, plus prednisone at 5 mg, or the same treatment with the addition of enzalutamide given at the standard dose of 160 mg daily for 24 weeks. Patients were stratified based on pain and visceral involvement. As a primary endpoint, it is the rate of patients without progression at the end of the treatment. We have several secondary endpoints, such as objective response rates, PFS, OS, safety, pain, and quality of life. We saw a PFS rate of about 89% in terms of the primary endpoint in 246 patients. What are the next steps with these data? Today, in the actual landscape of mCRPC, it is very difficult [to move new therapies through the pipeline]. Many of the pharmaceutical companies are focusing on early-stage disease. The data from this study may be considered a proof-of-concept for future development of combinations comprised of newer agents, such as apalutamide (Erleada) with chemotherapy in early-stage disease. What are some challenges faced with the AR inhibitors that still need to be addressed? At this time, it is very difficult to answer that question because we have a very low experience with apalutamide. The 2 agents, enzalutamide and apalutamide, have a very similar molecular structure. The main difference may be in terms of penetration of the blood-brain barrier. There is no other main difference [between the two] in terms of activity. In terms of early-stage disease, it is very difficult to understand the difference in outcomes for patients treated with these two agents. What does this all mean for patients? In this moment, we have reached the maximum of results in terms of improvement of prognosis in our patients, especially compared with 2 decades ago. Patients with mCRPC are living longer, but the main problem is that all of our available drugs target the AR, except for radium-223 dichloride (Xofigo). In the future, the main challenge will be to develop new agents that will be able to interact with different targets. Right now, we have several trials with PARP inhibitors and checkpoint inhibitors. We need to find more active targets for new drugs. Caffo O, Palesandro E, Nole F, et al. A multicentric phase II randomized trial of docetaxel (D) plus enzalutamide (E) versus docetaxel (D) as first-line chemotherapy for patients (pts) with metastatic castration-resistant prostate cancer (mCRPC): CHEIRON study. J Clin Oncol. 2019;37(suppl 7; abstr 148). doi: 10.1200/JCO.2019.37.7_suppl.148.